Finally I mananged to figure out what pictures to put in my bedroom. There is no secret I love music, is there? Not at all. So after some thinking I found out I wanted to use the Bruce-LP picture as one of four pictures. I didn’t have that many pictures that matched. Then I decided to make three more LP-cover pictures. Here they are! 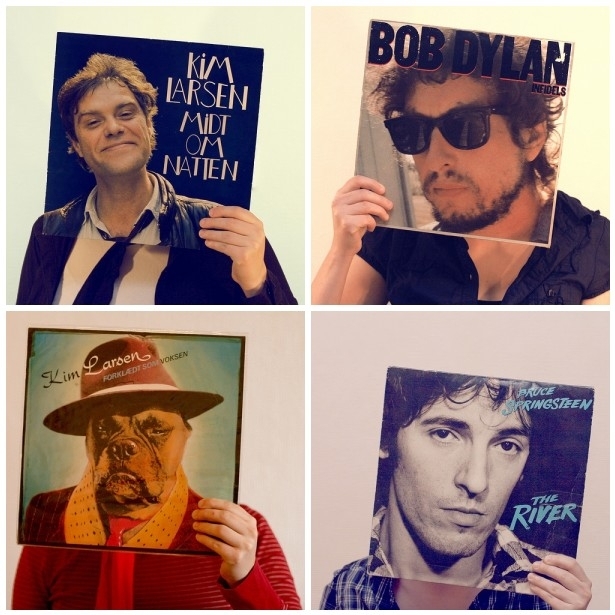 On tuesday I went down to Råkk ‘n Råll where they sell LP’s. I searched through the piles of LP’s and found the Bob Dylan LP. I saw other LP’s with headshots that would work, but it wasn’t of the right artist. I needed someone I like.The two Kim Larsen LP’s I already had. It took forever to get the two top pictures right. I used the timer on the camera. I had 15 seconds from I pressed it to everything had to be on place. It was not easy to get the LP in focus, get the clothes in the right position and the LP on the right place. I’ve lost track of how many times I tried and failed. If I only had had an assistant to help me I could’ve nailed the shot way sooner. I’m gonna send them to the photo-lab today and get them printed. Hopefully I can pick them up tomorrow.